Neck stretches and regular range of motion exercises are necessary to maintain a normal range of motion in the neck, maintain good posture, and prevent neck injuries. If you sit at a desk for several hours a day the joints in the neck would benefit from the movement. Neck stretching exercises are particularly useful in sports such as swimming, boxing, golf, wrestling, and any contact sport whereby the head or neck may come into contact with another player or any sport where full painfree range of motion is necessary for optimum performance. What are the major muscles of the neck? Why do we do neck stretching? What will happen if we don't do neck stretching? 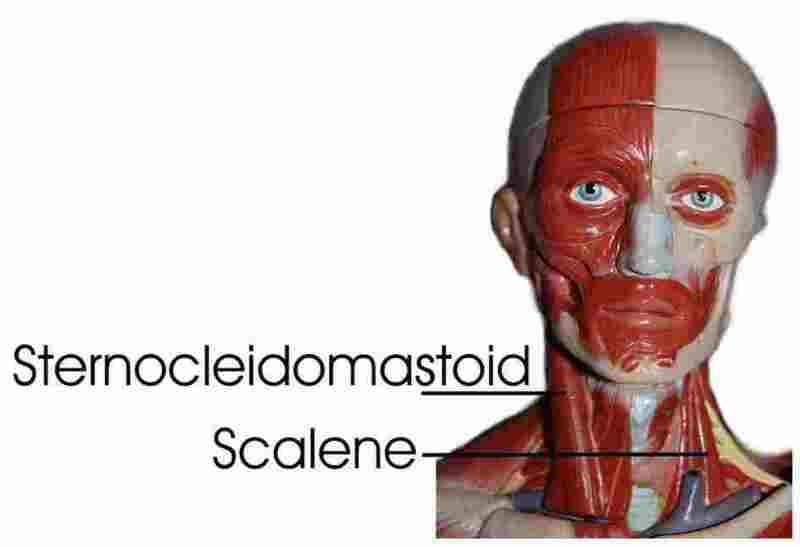 Below is a simplified list of muscles of the neck and their actions. Many muscles of the neck have more than one action. To lengthen shortened muscles, fascia, or ligaments. Prolonged forward head postures maintain neck extensors in a shortened position. This causes permanent shortening of the muscles, fascia and ligaments resulting in dysfunction, premature joint degeneration, headaches, and difficulty achieving normal posture. Muscles in the neck and shoulders often become tense under emotional stress causing headaches. The best way to get a muscle to relax is through a slow stretch. Stimulating golgi tendon organs (a nerve receptor found in tendons) through a slow stretch causes reflex inhibition and hence relaxation of the muscle being stretched. To move and lubricate joint surfaces. Cartilage derives its nutrients through movement and weight bearing. Sitting at a desk for prolonged periods deprives cartilaginous structures of necessary nutrients leading to premature degeneration. Like all joints, joints in the neck must be taken through their full range of motion on a regular basis or soft tissue shortening will occur leading to stiffness and dysfunction and postural problems. It is a good habit to perform stretches at least three times a week for any healthy joint. This stretch is for the long extensor muscles and the suboccipital muscles. Sit with your chest up and looking straight ahead. Stabilize your chin back as you gently pull the top of your head forward. This is a tilting movement. This is not a large movement so don't force this stretch and be gentle. Performing this stretch too quickly or too vigorously can cause headaches. Be sure to keep your chin retracted during this stretch to avoid shearing forces on the joints in your cervical spine. You want to stretch the muscles and other soft tissues on the posterior aspect of your neck, not stress the discs. If you have any discomfort during this stretch you may be doing it wrong or have underlying problems. Consult a physical therapist. The levator scapula raises the medial border of the scapula, assists in inferior rotation of the scapula, and can be used for sideflexion of the neck to the same side. This muscle also helps to retract the scapula and hold it against the trunk. The best method to stretch it is to stabilize the shoulder blade in an upwardly rotated position prior to stretching. This is achieved by elevating the shoulder and placing the palm of your hand between your shoulder blades. Tension in this muscle can be a common source of pain in those that have prolonged forward head postures as when sitting at a computer or driving for long periods of time. Persistent pain in this area can also be a symptom of more serious neck issues. If you have pain you should consult a physical therapist for a proper evaluation prior to performing any stretches. The upper fibres of trapezius when working on both sides will elevate the shoulders. The upper fibres, when working with the lower fibres will cause the shoulder blade to rotate upward. Because these fibres attach to the spinous processes of the vertebra and base of the skull, the head must be rotated toward the side being stretched prior to commencing with the stretch. Sit with your chest up and hold onto the chair with one hand. Turn your head toward the hand that is holding onto the chair. To feel more stretch, lean your body slightly away from the hand that is holding onto the chair to depress your shoulder further. 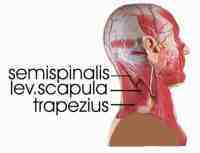 Constant tension in the upper fibres of trapezius can also cause headaches. Stretching of these muscles will help them relax. When acting unilaterally these muscle will sideflex the neck to the same side and elevate the ribs. These muscles are used to assist in breathing when breathing is difficult. Sit with your chest up forward on the edge of a chair. Hold the leg or seat of the chair tightly with one hand to keep the ribs down. Sideflex your head to the opposite side without flexing your head forward. You may find you get more of a stretch if you rotate your head slightly toward the hand that is holding onto the chair and slightly extend your neck as you sideflex. Tightness in these muscles can irritate the nerves that pass through them into the upper extremities causing upper extremity symptoms of thoracic outlet syndrome, tingling, numbness, and pain. If you are experiencing any of the above symptoms see your physical therapist for an assessment. When acting unilaterally this muscle will flex the neck, sideflex the neck to the same side and rotate it to the opposite side. When both sides contract these muscles will flex the lower neck forward and extend the upper cervical spine (protraction). This muscle rarely needs to be stretched but can become overactive if the deeper longus colli muscles are weak or underused. If you are having pain or tightness in your sternocleidomastoid you may have a more serious postural or movement dysfunction and would be best to consult a physical therapist. Sit tall with your chest up. Rotate your head to one side. Sideflex your neck to the opposite side. Extend your head back while maintaining sideflexion and rotation. The longus colli is rarely a muscle that needs stretching unless you have experienced a whiplash injury. in most sedentary individuals, those with forward head postures this muscle is kept in a lengthened position and so the muscle becomes lengthened and weak. To stretch the full length of this muscle you must extend the full length of your cervical spine. First retract your head by tucking in your chin. While keeping your chin tucked in tilt your head back. You may want to assist this with your hands for comfort. If you have experienced a whiplash injury, see your physiotherapist to determine if this stretch is appropriate for you.